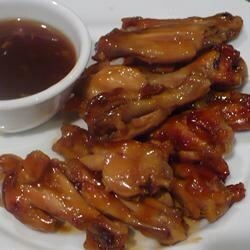 "These sweet and sticky chicken wings are sure to be a hit with the whole family. The sauce is so much better than store bought jarred sauce. You can fry the chicken wings, but I prefer baking for less fat. This recipe is equally good with thighs, breasts, or skinless boneless chicken. You'd just have to adjust the cooking time. Serve with fried rice and stir fried veggies. Enjoy!" Arrange the chicken wings on a baking sheet; bake until crisp, 35 to 45 minutes. Transfer the wings to a baking dish. Mix together the brown sugar, garlic, ginger, 2 1/2 cups water, honey, and soy sauce in a saucepan over medium-high heat; bring to a boil. Whisk together the cornstarch and 3/4 cup water in a small bowl; stir into the sauce mixture until thickened; pour over the chicken wings to coat. Return wings to oven and bake until the sauce is bubbling and the chicken is no longer pink at the bone and the juices run clear, 15 to 20 minutes. See how to make garlicky, crispy chicken wings. These were perfect!!! Thank you so much for such a delicious recipe!! !